In the novelty there are in harmony innovation and incomparable appearance. 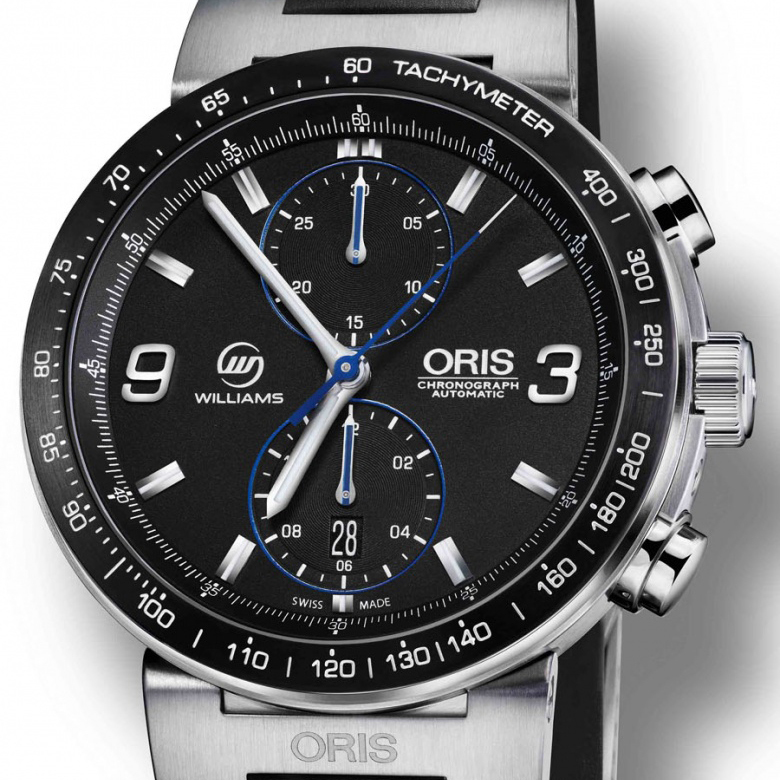 This model belongs to the world of motorsport Oris, therefore, the modern design is made with this sporty elegance. The steel case, with a diameter of 44 mm, gives a touch of timeless elegance to the watch, which is visible at a glance. Sports style emphasizes the new rotation in both directions with a black ceramic bezel ring, on which is located the minute scale. From the outside the bezel is equipped with a rubber coating. The watch dial consists of two parts; the outer edge of it is surrounded by attached directly to the case matte black ring with a tachometer scale. Great design of the chronograph is emphasized by the vertical structure of the dial with minute counter at the "12 o'clock" position and the hour counter set at the 6 o’clock position. The contour line on a black matte dial forms a brand logo at the 3 o’clock position and the original second’s indicator with growing red stripe at the 9 o’clock position. An unusual pointer of seconds is made in the style of the race car speed pointer. This is an example of an indifferent campaign of Oris to the design of sporty watches. On the black dial are marked applied hour markers and nickel hands, coated with phosphor Superluminova. The dial is closed by double-sided anti-reflective convex sapphire crystal. The back side of the watch is protected by a mineral glass, which allows enjoying the work of a Swiss automatic movement ETA 7750. The Oris Artix GT Chronograph watch is water resistant to 100 meters. The sporty image of a model is complemented by a rubber strap with a folding clasp. Official website of Oris watches.